This American toad is trilling to attract females to a pool of water at the Westboro Wildlife Management Area. Its puffed-out throat makes the trill louder and more intense. Toads eat insects, including mosquitoes, but notice the two mosquitoes feasting on this toad’s back. Spring brings song to the natural world, as we know from the wonderful chorus of birdsong that greets the dawn. But toads sing, too. In late April-early May, we can still hear spring peepers, but now the star songsters among the amphibians are the American toads (Bufo americanus). Listen for their trills from wetlands on warm evenings, especially after rain. If an American toad is nearby, its trill sounds bird-like. If you hear it and start looking around for a bird, you won’t be the first person to do so. A single trill can last half a minute or more. Male toads make the sound in their throat. The skin on their throat fills with air and balloons out, making the trill louder and more intense as it resonates. Spring peepers amplify their calls in the same way. From a distance, the wetlands seem to hum. The sound seems somewhat like the hum of insects on an August night. To some people, it’s like an electrical hum, the kind we sometimes hear from fenced-in electrical stations. In the spring breeding season, male toads get to the wetlands first and start trilling to attract females. Adult toads spend most of their lives on land, in woods, fields, yards, or gardens, but they breed and lay eggs in water. The eggs hatch into tadpoles, which live in water until they transform into toads. This is the famous “double life” of amphibians – life in water, and life on land. You’ve probably heard the expression, “horny as a toad.” Male toads don’t sport a showy appearance for the breeding season the way some male birds do, but they do develop horny pads on the first two toes of their front legs. These pads help them hook their front legs around a female. Toads fertilize their eggs outside the body. The male clasps the female from behind and releases sperm into the water as she lays eggs in the water. A chemical attraction helps the sperm find the eggs. Toads make other sounds besides their trill. In a case of mistaken identity, when one enthusiastic male toad clasps another male, the toad being clasped gives a loud chirp. This call sends the message that he’s not a female, and the other male lets go. The chirp comes to the rescue in other situations as well. A toad sometimes gives a loud chirp when a predator seizes it. The noise can startle the predator – or a person –into dropping the toad. Kids who pick up a toad often discover another of its other defenses – it pees on their hand. This works – the toad usually gets dropped. Adult toads and toad tadpoles have another defense. It’s their skin, which is toxic. It apparently tastes bad and can make small animals (including dogs) sick. The large bumps or swellings behind the toad’s eyes – sometimes called shoulder glands – are glands that produce the toxin. No wonder toads were reputed to be an ingredient in witches’ brew! The toad’s skin won’t harm you if you handle a toad, but it might irritate your skin. And don’t rub your eyes or mouth until you’ve washed your hands. Snakes, hawks, herons, fish, foxes, raccoons, and muskrats prey on toads. Our eastern garter snakes (Thamnophis sirtalis), which may share your garden with toads, are largely immune to toad toxin. So are eastern hognose snakes (Heterodon platirhinos), which are protected snakes that you might find in southeastern Massachusetts. Toads often resist capture by puffing up to make themselves harder to swallow, but hognose snakes have special sharp teeth at the back of their throats that they use to puncture puffed-up toads. This tiny new toadlet hides in the moist shadow under a decaying log. Its dark skin helps it blend into its surroundings. Don’t worry, you can’t catch warts from toads. People get warts from viruses. (Children often get warts before their immune systems are well developed.) Toads’ warts are glandular tissue. Toads’ skin is tougher and drier than frogs’ skin, but it still absorbs moisture. For this reason, toads don’t drink water. But for the same reason, toads (and other amphibians such as frogs and salamanders) easily absorb harmful chemical pollutants, pesticides, and herbicides. Toads’ appetite for insects makes them good to have around your yard or garden. Adults eat great numbers of insects, as well as slugs, snails, and earthworms. 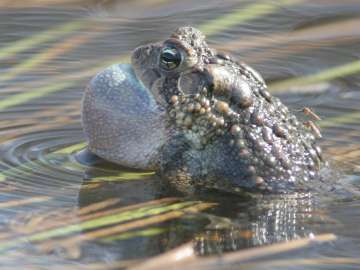 American toads shoot out their sticky tongue to catch flying insects. You’ve probably seen toads do this on TV nature shows. The eggs that American toads lay in Westborough’s waters this spring will hatch after about a week. The warmer the water, the sooner they hatch. The eggs can be harmed by UV light. Unlike the adults, American toad tadpoles are vegetarians. They eat lots of algae. Look for them in shallow water, swimming together in a group like a school of fish. This behavior gives them some protection, as does their toxic skin, but many become food for other creatures, sometimes even for other tadpoles. American toads tend to avoid laying eggs in pools with wood frog tadpoles, which hatch earlier and are carnivorous. Toad tadpoles grow for a month or two and gradually transform into toads. Their hind legs start to develop first, followed by their front legs. They develop lungs and lose their gills as they start to breathe air. Their digestive tract shortens in preparation for a diet of insects rather than plants. Finally their bodies reabsorb their tails and they move onto land. In early summer, especially July, look for tiny, dark toadlets hopping across your path, heading away from the wetlands. At this stage they’re about half an inch long, about the size of a penny or your thumbnail. Sometimes large numbers emerge around the same time, so if you find one, you may see many more. The toadlets grow to adults with chunky bodies, typically 2-1/2 to 3 inches long. Females are usually slightly larger than males. Toads are hard to spot because they’re active mostly at night, and their colors and spots help them blend into their surroundings. 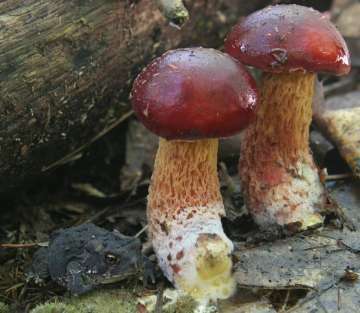 Their skin also can get lighter or darker to match their environment. You can often tell a toad from a frog without a close look by watching how it moves. If it hops, it’s a toad, but if it leaps, it’s a frog! In fall, American toads burrow deep into the ground, 3 feet down or more, to escape winter’s cold. Their bodies don’t make the “antifreeze” that keeps wood frogs (Rana sylvatica) and spring peepers (Pseudacris crucifer, Hyla crucifer) from freezing easily, or other substances that protect these frogs’ bodies from damage if they do freeze.